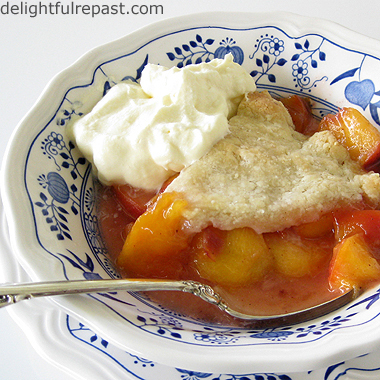 Peach cobbler is just one of the delicious ways I use peaches every summer. I go a little crazy for peaches and buy them, not by the pound, but by the 1/2-bushel box whenever I can. That's a lot of peaches! Enough for cobblers, pies, crumbles, upside-down cakes, shortcake, trifle, jam, ice cream and just eating out of hand, not to mention freezing. Aahh, comfort food! Not all cobblers are created equal. Some are cakey, some are biscuity, and some are pie crusty. Though I am happy to eat any of them, I always make the pie crust kind because that's the kind my Southern grandma made. Sometimes I do a bottom crust as well (because in my world there's no such thing as too much pie crust), but other times (like when I'm pretending to watch my fat/carbohydrate/calorie intake) I just do a top crust. This time I just did a top crust because I was almost out of flour. I go through a lot of flour! If you're one of those cooks who doesn't "do" pie crust (My sister-in-law, an excellent cook, doesn't even own a rolling pin! ), don't worry. You can make this. Without a rolling pin. Seriously. Just do it. Then come back here and tell me all about it! 1 Preheat oven to 400 degrees. In medium bowl, whisk together flour, almond meal and salt. If you don't have almond meal, just replace it with flour. Add half the butter and with pastry blender (or large fork or two knives or just your fingers) cut butter into flour until mixture has the consistency of coarse meal. Cut in remaining butter until the butter is the size of small peas. Sprinkle water over flour mixture; stir with large fork. 2 Turn the dough out onto a lightly floured piece of parchment paper and, with your hands, press it out into a 7-inch or so circle about 1/4-inch thick. Doesn't have to be smooth, doesn't have to be pretty. Cut into 6 to 8 wedges (however many servings you want). Refrigerate until ready to use. Or press it out any old way and cut it into any shape you like, such as I did on my Blackberry Cobbler. Cobblers are supposed to be rustic. 3 Peel peaches (or not, if they're thin-skinned and smooth like these) and slice into a large bowl (I use a 2-quart glass measure). You'll have about 6 cups of sliced peaches. (I slice them like this: Quarter peach, cut each quarter into 4 wedges, cut wedges in half.) In a small bowl, whisk together sugar, cornstarch, salt and spices; add to peaches and mix gently but well. Pour into 8-inch-diameter 2-inch-deep round baking dish that you've sprayed with cooking spray. Place pastry wedges on top. 4 Bake at 400 degrees for about 55 minutes until peaches are bubbling and pastry is nicely browned. Let cool one hour before serving with whipped cream or ice cream. Thanks, Judy! Does that mean WE are the proverbial "Great Minds"?! I like how you said "a real crust." That tells me we're definitely on the same wave length. Ah I like a good cobbler. Very interesting word , "cobbler," Jean. A cobbler is somebody who makes and repairs shoes. Cobbles are shaped cuboids of granite used to pave streets in the Georgian period and early Victorian period. Over here if you say, "Cobblers," to somebody it is a retort to something they have said and means ,"what a load of rubbish." It can also have a slightly ruder reference when saying,"cobblers," to two very delicate parts of the male anatomy. Tony, thank you for mentioning the cobbler facts that I, of course, would be too delicate to mention myself! I love cobblestone streets and one day will have the closest thing around here to it, a "faux" cobblestone driveway. Love peach cobbler - yours looks so delicious!! But more interestingly, Blue Danube china? That is what I have too - it was my granddad's and I got it when he moved into assisted living. I love it! Thanks, Melanie! Yes, I have a lot of blue and white. No self-respecting Englishwoman or Anglophile can exist without her blue and white china! p.s. on a more serious note, I just heard from Jan in Norway, and he is ok, though his former office in the Ministry of Trade was destroyed in the bomb blast and he is in disbelief. Declaration of Independence! You are bad! 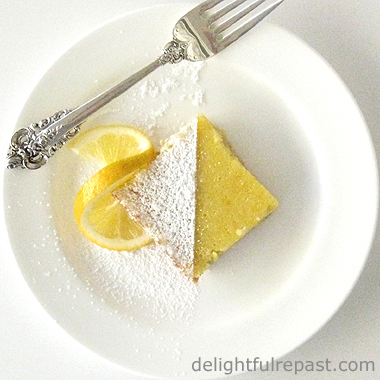 You could soooo make that crust, slap a little store-bought lemon curd on it and call it lemon meringue pie! Glad Jan is "okay," though something has been taken from them all that they can never get back. So sad. I love cobblers & crumbles!!! They are easy to make, delightful to have & light on the tummy!!! Thanks for stopping by, Prathima! I must check Prats Corner for an Indian bread to go with my Chicken Tikka Masala (posted July 8). I'm more fond of the pie top too! This looks so wonderful! Thanks, Jenn! Yep, I could just bake up some pie crust and eat it plain--no pie needed! I love the taste of peaches, I bought a bunch today, now I think I'm going to have run to the fridge and eat when to satsify my craving. It's my favorite flavor! Enjoy! Beautifully said. I agree wholeheartedly. Thanks so much for stopping by, Greg! Annnnnnd bookmarked. Lord have mercy, that looks delicious! I love that you use almond meal in your pastry, by the way. Ally, thank you soooo much! I'm sure my readers will like your blog, and I hope yours will like mine! Learned something about almond meal today. Usually when I get a bag of it I have several things to make and use it up fairly quickly. This time I knew I wouldn't be using it all, so I put it in the freezer. And today I went to use it and discovered it was frozen solid! So I'll have to thaw it out before I proceed. Thanks, Jami! I hope you like it. It's one of the few things that is both super easy and painless as well as too satisfying to have been so little trouble!